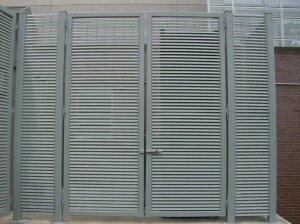 Looking into custom louver installation? Familiarize yourself with the benefits of aluminum, which is used in many louver installations. If you’ve ever looked into custom louver installation, you may have noticed that one material is typically used in the construction: aluminum. Aluminum may seem like an uncommon building material for fences, even in comparison to other metals like steel. So why is it that if you look for custom louver installation, you’re most likely to find an installer who works with aluminum? Aluminum is a material that offers a ton of benefits—and today we’re looking at why that has turned into being such a quality material for custom louver building. Business owners know how valuable their time is. That means any way you can cut down on maintenance, which is ultimately more time consuming than anything else, creates more opportunities to use your time wisely instead. Aluminum is a durable material that lets you focus on what’s important. While it’s a lightweight metal, it’s still capable of resisting damage, corrosion, and even rust. If you live in an area that sometimes deals with inclement weather, you don’t have to worry about your aluminum louvers being damaged, either. What do you need your custom louvers for? There are many benefits, but whatever they are, aluminum louvers are capable of versatile building options to suit any need. Since the material is lightweight and flexible, it is capable of being incredibly customized and reshaped into whatever you need. Just about any empty space can have a louver customized to fit it. Aluminum is perfect for the kinds of customization that anyone seeking custom louvers will need. Being environmentally friendly is all the rage these days. For those of us who want to invest in green building methods, aluminum is a great option. Aluminum is entirely recyclable so it can be reused in the future, which helps reduce the waste generated during the building process. Eventually, your louvers may need to be taken down, but that material will go on to live another life. This entry was posted on Sunday, February 3rd, 2019	at 4:58 pm	. You can follow any responses to this entry through the RSS 2.0 feed. Both comments and pings are currently closed.